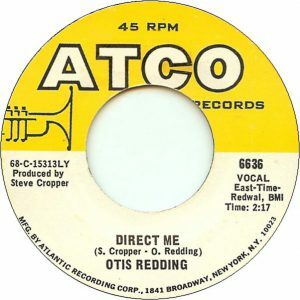 Yet another song recorded just prior to his death, “Direct Me” is a funky rocker, fueled by a corkscrew guitar part from Steve Cropper and anchored by an insistent tambourine. And while it seems totally unfinished — the sound is a bit distant, and there aren’t any horns anywhere — it’s still a great enough song to transcend its relative sparseness, as it’s part of that burst of songwriting & recording that Otis did just prior to his death. Part of that is Steve Cropper, who did absolutely yeoman work as the producer of all of Otis’s posthumous albums, and whose guitar playing almost steals the track from Otis. Almost. And while Cropper utterly kills it — check out his spiky hooks underneath the verses, and his amazing chunks of rhythm after the bridge — “Direct Me” still belongs to Otis, who sings it like he’s just walking up to random strangers demanding directions; voice desperate and strangled, totally and utterly lost, and yet still somehow enjoying the quest.